These was a time, up until a couple of years ago, when I was silly enough to think that if an Imperial Good Companion looked like a Model T, it was a Model T, even if it wasn't labelled as such. At some point I eventually twigged that "T" stood for tabulator. My mind must have been diverted by the thought of Model T Fords. 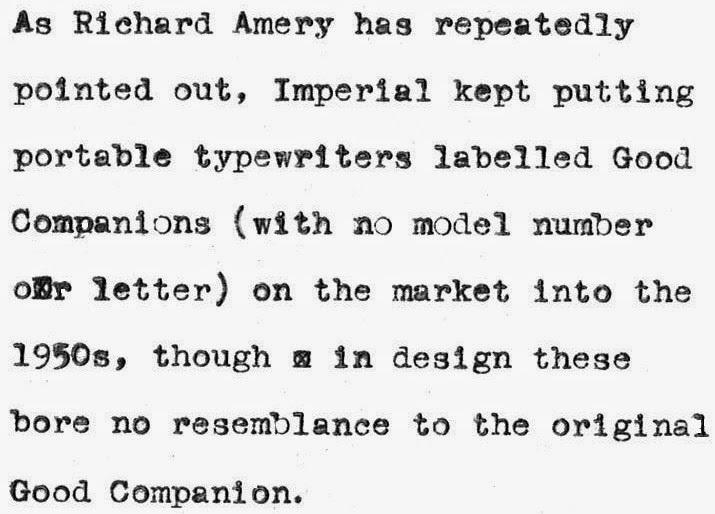 There is, of course, no such thing as an Imperial Good Companion labelled a Model 2. The Typewriter Age Guide, however, insists on referring to the No 1 and to the No 2 model. The first Imperial Good Companion to have a model number on it was the No 3, the first segment-shifted IGC. An Imperial Good Companion "Model T lookalike", the one that isn't a Model T but is just a plain Good Companion, came into my possession with the "booty" of 25 typewriters I received the weekend before last (along with two Good Companion Model 7s). It is the eighth of those 25 typewriters that I have had the chance to take a close look at. I did service one of these "lookalikes" once, but at that time didn't take the opportunity to look more closely at the differences between it and a Model T, or to put the two alongside one another. I guess there was resistance in my head to thinking of a machine labelled just an Imperial Good Companion as being anything other than the beautiful original model, the 1930s IGC. Sydney IGC collector Richard Amery kept telling me Good Companions were still being made into the 1950s, but when he said "Good Companion", I couldn't picture anything but the shiny black model. Given this, it seems odd to me that, with the additions made to the Model T and maintained on the Model 3, the on-going plain ol' Good Companion would appear to have become the cut-price version. The Model T above, serial number 2HC894, was made in 1950. The Good Companion beside it, serial number HV501, was made in 1952. On both machines the serial number is under the left side ribbon spool. On earlier models, the serial number is on the front right, under the spacebar. On later models, the serial numbers are under the machine, near the bell. OK, so having now compared the two, I can see many differences from the Model T. Like the original IGC, the one above has no left side platen knob, no paper plate guide and, of course, no tabulator. The arrow (above) is a tab clear switch. I can't say when this Model T lookalike version of the IGC was first produced, but I can say that the first Model T, in 1938, was different from the post-war Model T seen above. For one thing, the tabulation device changed from an out-moded one on the first Model Ts, a design dating back to 1919, to a more up-to-date and conventional one. This machine, serial number 3V312, was made in 1956. I'll be doing a post on it after I finish cleaning it up and adjusting it. The more I think about Nick's new Good Companion, especially having just read your post, is that the '1' on the ribbon cover is really a slightly defaced/worn '4'. Plastic keys but otherwise very like a Model T without a tabulator. I've recently come across a good companion (not model t) but can't work out the serial number. Its under the left ribbon spool marked JC 943 but i can't find any serial numbers with the 'JC' at the start. Its a grey imperial the good companion (as written on the front) any light on this would be much appreciated. The year of manufacture is 1956. There's no mystery about "JC" - the sequence went from IZ at the end of 1955 to JM at the end of 1956, so JC dates it to about March 1956. Thank you so much. I must have been reading the serial list wrong. Thank you for sharing the knowledge. Its much appreciated. No worries. For future reference, IGCs started with the code B in 1932, reached S and switched to AD in 1935, reached CZ in 1939 then went DA, DQ, ED, EL, EY, FF, FO, FU, GC, GL, GV, HF, HP, IB, IN and IZ for each subsequent year (to 1955). The last two years were JM (1956) and JY (1957). In 1956, each second letter (after J) from JA to JM roughly represents one month. My model is a serial number starting with EN, not listed in your codes, presumably dates it somewhere 43- 44? 1944. These are not MY codes, but Imperial's. The Age Guide doesn't list every single letter combination because it assumes owners can work it out for themselves. I've just bought a model T for a graphic design project but can't seem to get it working. I've got a few other typewriters but this one has stumped me. Can anyone help if I email them the issue? What exactly is the problem? Does the carriage move when you press the space bar? Can you move it using the carriage release levers? Hello, I own a Good Companion 3, it is the same as the bottom picture shown in the blog post, however mine has all grey keys... It doesn't have the typical green keys on the sides... Does anyone know why this may be? Have they been replaced at some point? Although they do appear to match perfectly with the other keys... Any info would be great! Thanks! I found a lovely IGC model 3 but I am mystified! Unlike others I have seen during my research, it has circular chrome surround keys, not plastic. The serial number is 3C 028 which I cannot find in the typewriter database! It also has eight math keys. Hi I have my grandfathers Imperial Good Companion (have had it for years and it rarely comes out of the case) the serial number is at the front DM 693. I am trying to work out the year. I am thinking 1950's. Where can I go to find out the year of manufacture? Hello, I have an Imperial The Good Companion Model T with serial number 2D328. It belonged to my late father. Can you please advise on the date of manufacture?